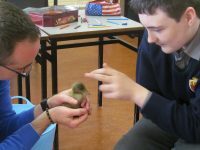 At Castlerea Community School, Science is available to all students to study at Junior Certificate level. 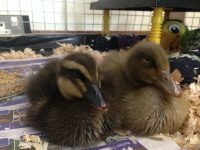 After the success of hatching our ducklings last year, the Ag. 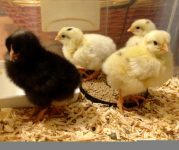 Science students decided it would be very fitting to incubate and hatch chicks for Easter. Like any good developing business the decision was made to sub-contract out the job and Katie Hegarty was the successful student to win the contract. Katie incubated eight Silkie X Bantam eggs sourced by our secretary Mary Neary. Six of these survived to the final stages of development, with four chicks successfully hatching. Katie brought the chicks into school this week to where they quickly developed their own fan club. We’ve been told they are quite the hit on snapchat. From an agricultural perspective, following their development and growth has presented an opportunity to incorporate many aspects of the syllabus in a more practical and fun manner. 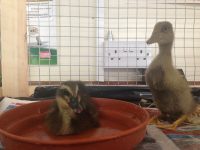 The chicks will be returned to Katie who will rear them herself and we look forward to following their progress. Fingers crossed the Home Ec. 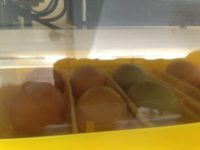 Department will have their own supply of eggs in the near future.